You are here : Home / News / offers and cashbacks / Amazon curtain raises for "Great Indian Sale"
Amazon curtain raises for "Great Indian Sale"
E-commerce gaint amazon will come up with exciting festival offers.Amazon announced the dates of Great Indian Sales.On the occasion of Independence Day this sale will commence from 9th august and will end on 12th august.Amazon prime members will get additional benefits(Prime only deals) rather than normal customers. 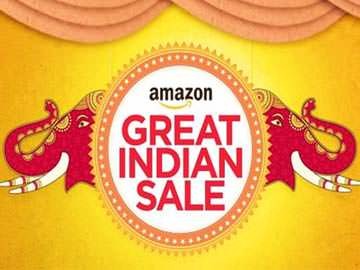 As a part of Great Indian sale Amazon also offers "Amazon pay balance only deals".This sale will kickoff from August 4th.Under this deal 15% additional cash back will be provided to it's customers.Instant cash Back will be provided on apprels,storage and home consumables.Along with these deals Amazon also announced that black Bastet deals on some brands. Amazon announced, SBI debit and credit card holders will get additional 15% cash back on app purchases and 10% cash back on website purchases.Expensive paid trips will be offered to the customers who will make purchases on Amazon app. So hurry up, ready to be drenched on exciting Amazon offers.